Devise a plan for reducing health care costs for a cohort in your personal network and share it with a panel of health care professionals. 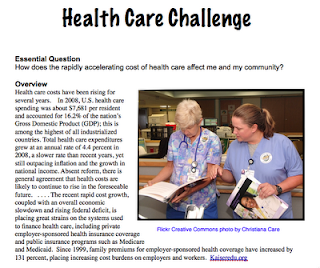 The idea for health care as a "big idea" came to me through an email on which I was copied. Several ADE's had been invited to submit a response to an issue regarding a new CBL Teacher's Guide. 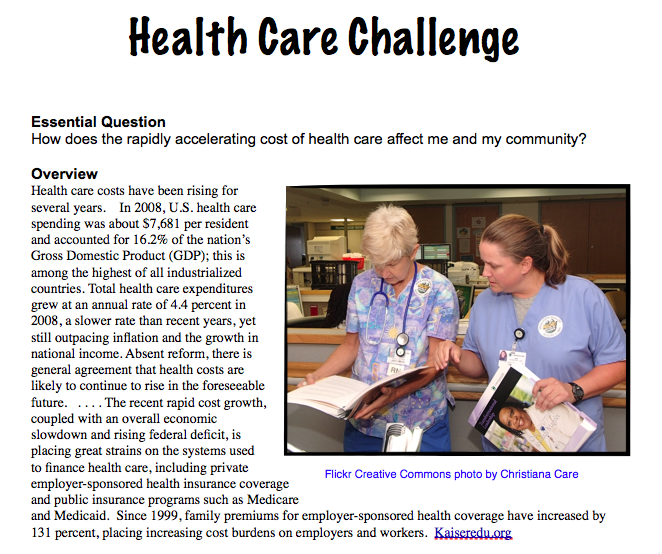 In his submission, Marco Torres floated an essential question about health care which I modified as a point of departure in my class. The idea for having the students present to a panel of experts came from my colleague, Cindy Richter. In a recent professional development group, she floated a scheme of having her econ students develop business plans and then pitch them to people in the community with the expertise to evaluate it. I thought this was a fantastic concept and decided to bake it right into my students' challenge. I'll keep you posted on the students' progress! Thanks. Extremely challenging, but process is everything. I have in mind that the students will present their plan to a panel almost like a defense of a dissertation-- one of the purest forms of learning and assessment. Faster, Lighter, Less Expensive-- Here They Come!